Straight Flat and Cleated Modular Plastic Belt. Curved Flat Plastic Modular Belt at 45°, 90°, 135° & 180°. Conveyor Widths: 4” to 36” (102mm to 914mm) in 2” increments. Conveyor Lengths: 36” to 83’ (914mm to 25.4m) in 1” increments. Loads up to 20lbs/per square foot of belt (90kg/m2). Speeds up to 260 ft/min (78.6 meters/min). 3 Product Transfers to Choose From. No Drilling Required for Ease of Automation or Guiding. Attach controls, photo eyes, low voltage wire, & air tubing. Attach accessory bar for mounting several automation components. 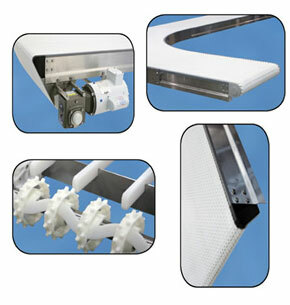 Attach any of standard guide packages to tailor fit conveyor. Speeds up to 260 feet per minute. Available in Straights and Curves. 1” Nose Bar Tails for small part transfer. Powered Transfer for maintaining speeds through transfer. Roller transfer plate for smooth product transfer in minimal added length. Standard product that is pre-engineered.